Castle Immergrün is an impressive subterranean complex of old steam tunnels, abandoned sewers and half-completed and long forgotten subway tunnels. No other area of the Duchy was built with the sole focus of defensibilty. The Market is located within the boundaries of the Castle, as are the "official" offices of the Duchy. When Max holds a public court, he does so in the large Courtyard that sits next to the Market. A large chair, built from the remnants of a large Lazyboy recliner, is brought in and set upon a makeshift platform so all could see their leader. Hand painted banners are displayed, bearing the heraldric arms of the Duchy, the Duke and all the Nobles and Knights present. Many of the Tradesmen of the Duchy carry their stall's banners from the Market. At other times, the Courtyard is used as a public gathering place, school room, and cafeteria. Private courts are held in the Duke's "Throne Room." Max hates that term, but the others insist on calling it such. Max simply refers to it as his Study. Here he has a few of the trappings of office displayed for his personal edification. A smaller version of his banner hangs on one wall, while most of the wall is covered with a reproduction of the Bayeux Tapestry and a portrait of a German Landsknecht. A map of the Baronies of Port Alexander share wall space with the banner. A few book shelves hold his personal library, collected with care. His old particle board desk is in a corner, holding the few momentos of his past life. A new, hand crafted oak desk sits before the book collection. Behind that is a high backed office chair, salvaged from the dumpsters behind a flagging dot-com. The desk is usually covered with papers detailing the different aspects of the Duchy. Mounted on a stand on the desk is the dagger Max had brought back from his adventure in the distant past. Some hundred miles west of Port Alexander and some small ways up into the low mountains, lies the resort town of Goldwood Springs. The town takes its name from the mineral hot-springs that bubble to the surface in the area, and they form the basis for the town's tourist economy. In the late 1800s, the town was a popular destination for those "taking the cure", and many famous people came to the small town to rest and bathe in the pool which were advertised as a panacea for everything from consumption to acne. These days, a number of modern hotels have been built up around the largest of the hot-springs, and an exclusive spa around a small cluster with unusual concentrations of trace minerals. Water from the spa is available in bottled form, and sells well in Port Alexander. The town sprawls at the base of Mount McKenndra, one of the highest peaks in the state, with a summit at 5,700 feet. No roads lead to the top of the mountain, but a rather strenuous hiking trail does. Very near the summit is another smallish hot spring, and those few who do make the effort to climb to the top often relax in the pool for a while before descending. Not many make the climb, and even fewer make the attempt during winter. For those who find Goldwood Springs too crowded or too expensive, there is Lake Godluch. Situated in a national forest, the large lake is accessible on one side by car, and has picnic and camping facilities as well as boating - powerboats of any kind are forbiddden, though. The distant side, however, is inaccessable save on foot or by boat, and is for all practical purposes wilderness. Once away from the lake, the forest becomes dense, and the mountains difficult. Every few years, hikers are lost in the backwoods, and sometimes they are never found. 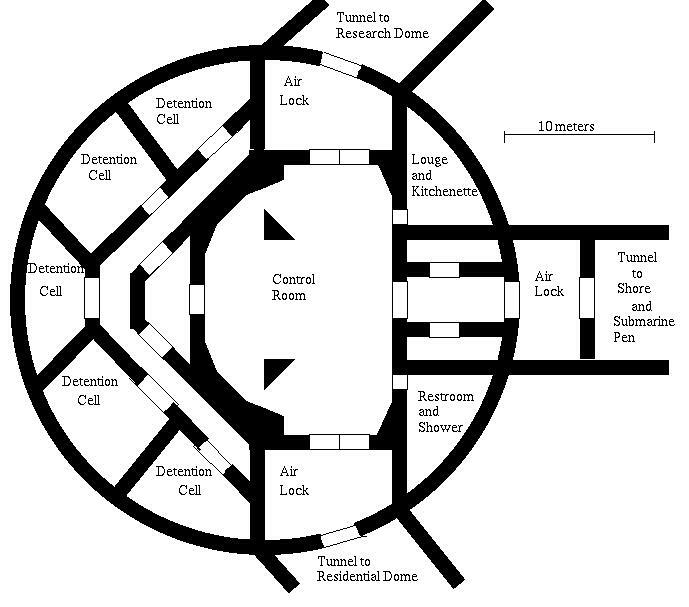 The Para-Normal Detention Facility (PNDF) is the premiere penitentiary and high-security hospital for super-powered criminals and para-normals. Despite the resources devoted to the PNDF, breakouts and escapes are common, since "super-villains" are by their very nature difficult to quantify and counteract. Still, the PNDF does a better job than any other institution in the world. The PNDF is located in the mountains East of Goldwood Springs. It is hidden away in an inaccessible region, and is not listed on maps. Military style checkpoints guard the only land access route. The Fortress is located approximately 6 kilometers out to sea, on the ocean floor, and is accessible through three primary means. A secret panel in the back of the "Quick Response Alarm Company" (an IPAC front) warehouse gives onto an elevator which leads to a tunnel and monorail system. A hidden underwater entrance in the river nearby leads to a pool in the tunnel near the monorail head. 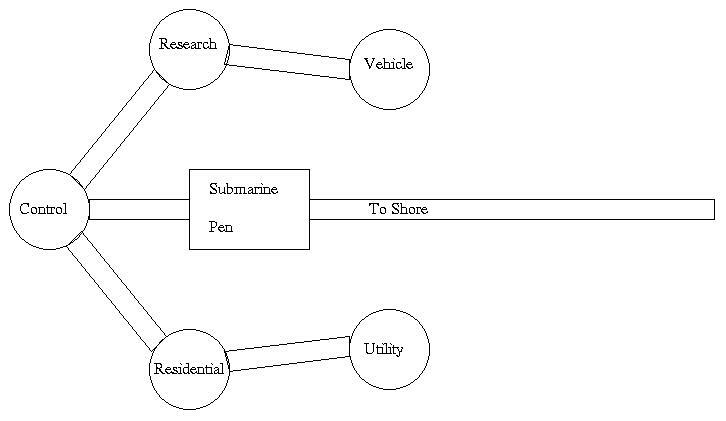 The submarine pen gives direct access to the ocean. 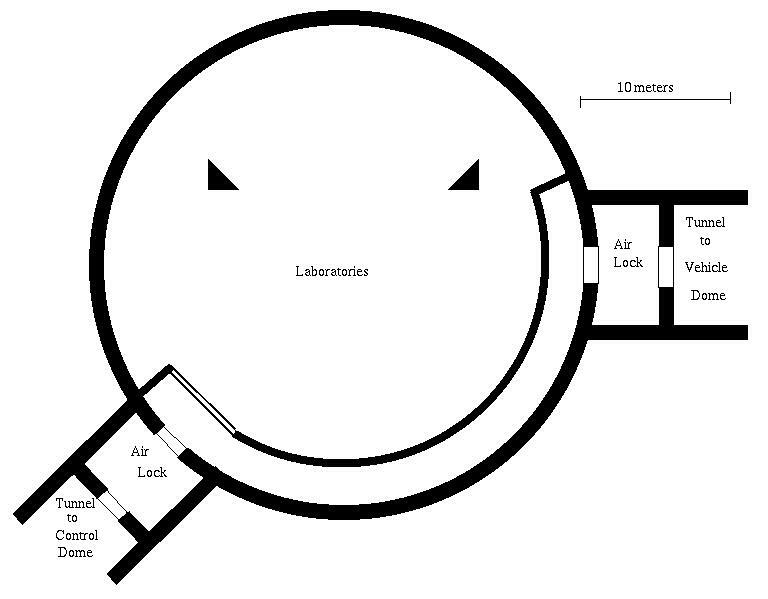 The Fortress consists of five domes and the submarine pen. The control room houses the central security, computer and communication equipment. It is equipped with comfortable and ergonomically correct chairs. The lounge and kitchenette is provided for the convenience of those on duty in the control room. The detention cells are quite sturdy and capable of restraining even some superstrong prisoners. The card-key pressing equipment is here as well. 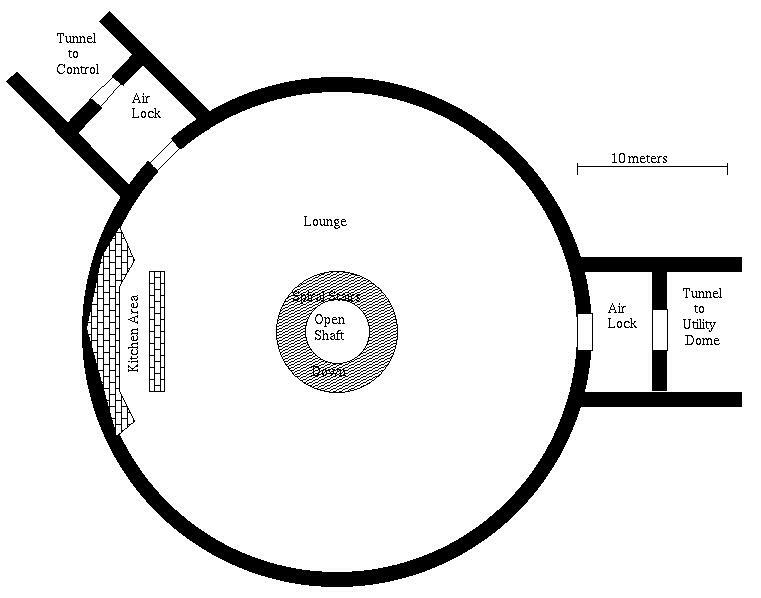 The top level of the residence dome serves as a lounge, living area and dining area. One side has a fully equipped kitchen with a long bar/counter area. There is some furniture about, but room for more or for redecoration. Parts of the dome are transparent, and lights are attached outside for viewing the underwater life. A spiral staircase in the center leads down to the apartment level, and has an open shaft in the center to allow fliers or jumpers to bypass the stairs. Actually more of a Wall of Heroes. Ka-Sador constructed display cases along the walls of the lounge and transferred personal effects of the fallen Eagles into them to honour these departed warriors. Each of the Fallen Heroes cases bears the nameplate from the Hero's apartment. The trophy cases contain other trophies of interest. Contained numerous photographs of the hero (or was that heroes?) in action and the three identical medals which were awarded by the mayor of Port Alexander were draped over the mounted costume he wore so valiantly. The man who led the Eagles. His golden uniform was mounted on the wall, near it was a letter of thanks from President Carter and his Doctorate from MIT. Several photos placed around a textbook written by Jeff Anderson, Protector's real identity, rounded out the collection. The centerpiece here was her breastplate -- all that remained in the dome containing the amoeba which had nearly destroyed the new heroes in their battle with Overlord. Her favorite book of history added a human quality to this stalwart defender, as did the signed copy of a Zeppelin II test pressing. Upon returning from the past, the heroes deposited some souvenirs into the trophy cases. The Beggar King brought back a breastplate and a sword which are now mounted in this case. Not a fallen hero, Ka-Sador departed and returned to space as Captain of Princess M'Krell's guard. His wing-armour and a bola remained here in this case as mementos. This level is actually set into the rock of the ocean floor. There are seperate showers/bathing facilities for men and women and seven apartments. Each apartment has private restroom facilities and some configurable walls allowing the tenant to partition the room. Each has some basic furniture - a bed, table, desk and chair. When the Protectors took over the Fortress in Issue Eleven or so, they discovered that three of the apartments seemed to have been occupied. The other four were vacant. The occupied apartments were locked and were left untouched, unsearched and intact until Issue 21 when Ka-Sador transferred some of the contents to the Hall of Heroes cases in the Lounge. Each occupied apartment had been customized slightly as to layout, and had been furnished according to its owner's taste. Apartment #1 was Triplex'es apartment, but is empty as of Issue 22. Apartment #2 is occupied by Defender on a part-time basis, who moved in between issues 21 and 22. Apartment #3 was Protector's apartment, but is empty as of Issue 22. Apartment #4 was occupied by Ka-Sador, who moved in between Issues 21 and 22, and out in Issue 30. It is vacant as of Issue 31. Apartment #5 is the guest room. Apartment #6 is occupied by Lorelei Crosby aka PC who moved in the week of 10-3, year 1. Apartment #7 was Howitzer's apartment, but is empty as of Issue 22. 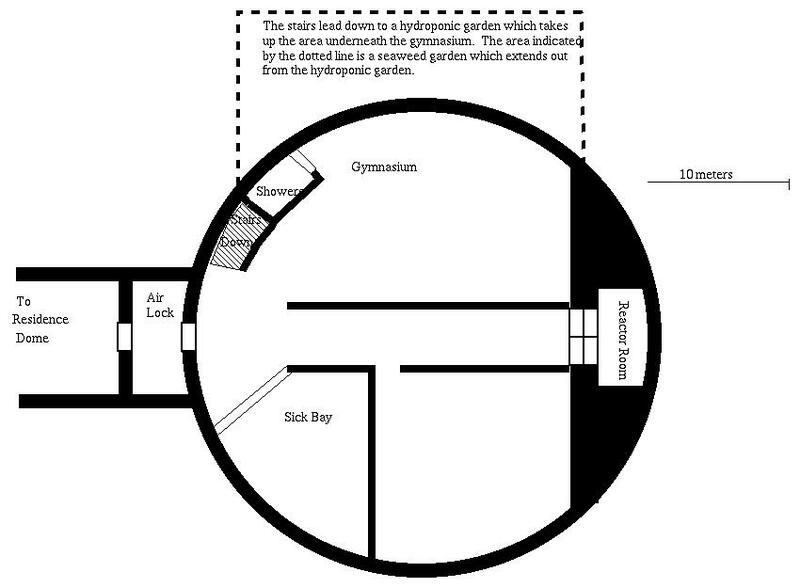 The utility dome features a surprisingly modern gymnasium, modified for use by superhumans, and a sickbay which contains many advanced kinds of surgical and medical equipment, although the medicines are almost all expired. The reactor room contains a fusion reactor of stunningly innovative design, which uses seawater as reaction mass. The reactor powers the entire complex, as well as a small desalinization plant which provides fresh water and an electrolysis unit to extra oxygen from seawater for use both in life-support and to power hydrox fuel cells for the vehicles. Stairs lead down to a hydroponic garden below the gym, which is connected to a seaweed garden which extends further out. The gardens are completely enclosed, although seawater filters through and across the seaweed garden. Neither garden is growing anything usable. The hydroponics are all dried out and the seaweed garden has gone wild and now clogged the filters, so the pool is stagnant and disgusting. By the beginning of this issue, the seaweed garden is mucked out and chopped back and beginning to thrive. The hydroponics is almost working again, just a little more work and then planting. Ka-Sador has done all the work and is showing a surprising green thumb. The use of the large empty area is open to speculation. As of Issue 35, all the remaining equipment from the destroyed labs in the Research Dome has been moved here. This area was pretty well destroyed when the Protectors took over. It has been cleaned up, and, as of Issue 35, the equipment moved into an empty room in the Utility Dome. The labs were designed to be reconfigurable with movable partitions. The body armour belonging to Howitzer was returned to her room and later relocated to the Hall of Heroes. As of Issue 35, it is being used as a team training facility; still just an empty space, but large enough to move in and practice tactics. Sometime in the past, this dome had been ruptured and flooded. It has been patched and pumped, but most of the vehicles were badly damaged by their long immersion. 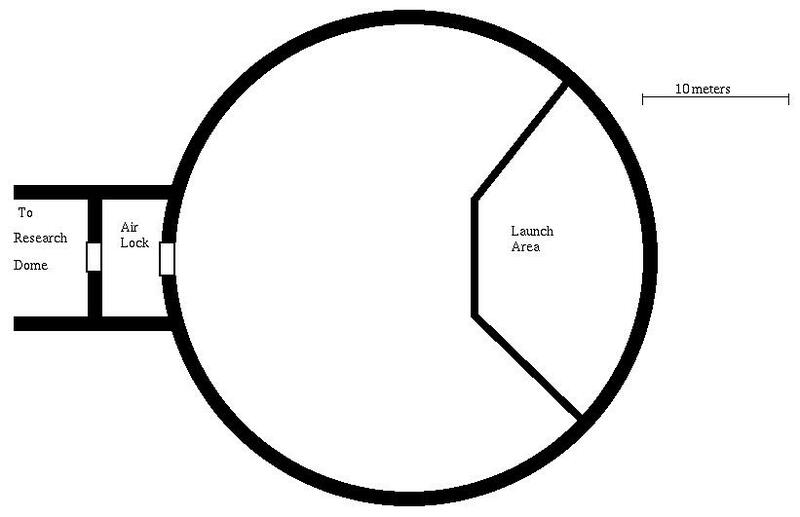 The edges of the dome are filled with vehicle bays, facing outwards, and the entire dome floor rotates, so that a given vehicle can be brought to the launch area and shot down and out into the ocean, or recovered the same way. Several vehicles have been repaired with the aid of the Round Table's Squires: a jet, a half-track and a mini-sub. The half-track has to been designed for underwater use as well as use on land, and the plane can function for short periods of time underwater as well. The sub has no other capabilities. The famous EagleWing flying sub is not in the vehicle inventory. Its wreckage was discovered underneath The Floating Island, in Issue 32. The EagleJet can function for short periods of time underwater; long enough to surface and get airborne after being launched from the dome or to land and reenter the dome. It is VTOL and capable of water landings and takeoffs. Top Speed: 900 mph (roughly Mach 1.25), Cruising speed: 800 mph (roughly Mach 1.2). Range: 4,000 miles at cruising speed. The EagleJet was destroyed and sunk in Issue 32. In exchange for training Merlynne, the Protectors got some concessions, including transport. In this case, a cute little JumpJet which is hangared at PA Airport. The minisub seats four and is capable of operating underwater for extended periods of time. It has a top speed of 25 mph submerged, 35 mph on the surface. It is equipped with two sets of gripper claws. There is no airlock, but a hatch in the bottom opens to allow access to the sea - just don't turn the sub over with the hatch open. Travel with the hatch is strongly counter-indicated.